images that are being created right in front of their eyes... all from a box of sand. Evgeni Sverdlov: painter, sculptor, designer and art teacher. Born in St. Petersburg (Leningrad) in 1963, graduate of the Leningrad Art Academy. His works were presented in numerous exhibitions worldwide. 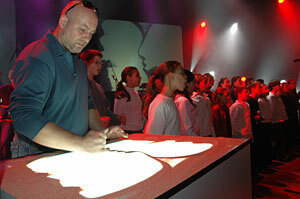 In 2004, Mr. Sverdlov formed a collaboration with AVS and together we create successful multimedia and TV productions using many unusual techniques that continuously captivate and inspire audiences around the globe.